Warm weather is here and it's time to start those exterior home projects you have been planning all winter. If a DIY home siding installation is on your list, it may be a great opportunity to tackle a few of those other remodeling improvements that have always seemed too overwhelming. A lot of home improvement projects seem like they could turn into a major affair to the casual do-it-yourself homeowner. Adding a window or two to your home, moving a door to a more convenient location, or installing sliding glass doors in your family room may seem like a huge undertaking. There is a lot of work involved, and you don't want the home's exterior to look like it's patched together. If you are careful, some of these improvements can be completed with little interior disruption. Time and budget may not allow you to do all of the projects on your list, so it's a good idea to purchase extra material for your siding installation. 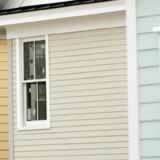 That way, you can be sure of a perfect siding match when you start the second part of your list next year.